If you enjoy these cartoons, please help me make more by supporting my Patreon! A $1 pledge really matters. My favorite foreign policy writer, these days, is Daniel Larison, who writes for The American Conservative. Larison’s beat is American foreign policy, and as you can imagine, his column is often an angry one (regardless of which party holds the White House). If you’re interested in consistent, sharp takes on US foreign policy, I’d recommend reading Larison. And if you do, you’re going to hear quite a lot about Yemen. Nicholson acknowledges the humanitarian crisis in passing with a link, but he doesn’t mention and doesn’t seem to grasp that the U.S.-backed Saudi coalition bombing campaign and blockade are responsible for most of the suffering of Yemen’s civilian population. He does not confront his readers with the number of people at risk of dying from famine (more than eight million), the number of food insecure Yemenis (more than 17 million), the number of people infected with cholera (more than one million), or the figure that a Yemeni child dies every ten minutes from preventable causes. And U.S. support of this tragedy has been bi-partisan, I’m sorry to say. This cartoon has four panels, plus a small “kicker” panel under the bottom panel. Two men are talking. One, representing the US, is a man in a Hawaiian shirt wearing a stars-and-strips “Uncle Sam” top hat. The other man, representing Saudi Arabia, has glasses and is dressed in Saudi-style robes similar to what Salman bin Abdulaziz Al Saud wore when he met with President Trump. Top Hat is angrily spreading his arms; Glasses is looking downward, apparently abashed. TOP HAT: Saudi Arabia, your atrocities in Yemen have gone too far! Top Hat continues to yell angrily. Glasses sadly shrugs. TOP HAT: I mean, hitting a school bus with a missile! A school bus! Top Hat sternly points a finger; Glasses has turned his back on Top Hat and looks a bit bored. 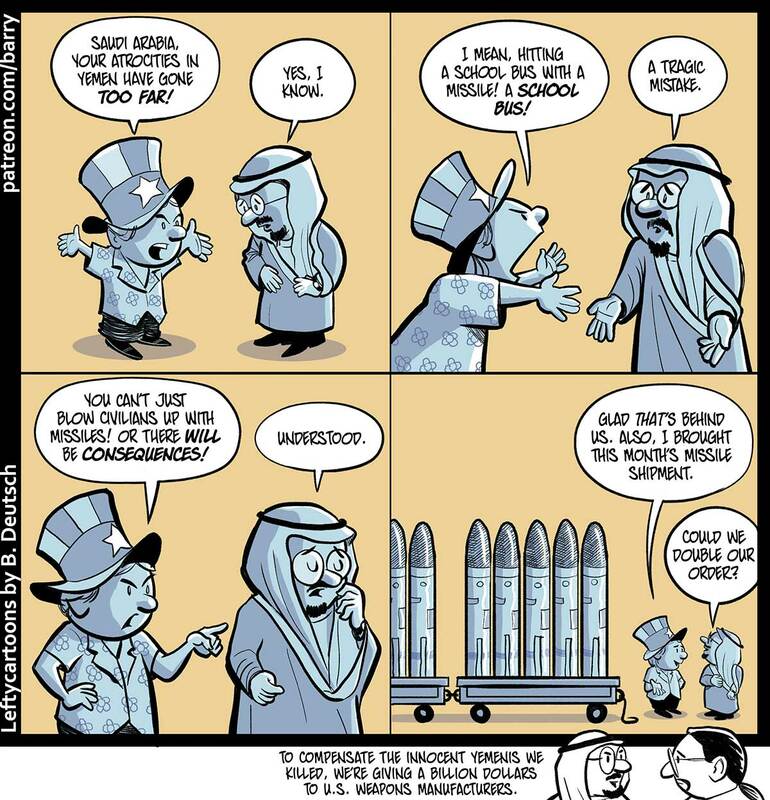 TOP HAT: You can’t just blow civilians up with missiles! Or there will be consequences! The “camera” backs way up, and we can see that Top Hat has huge carts full of huge missiles with him, dwarfing the two characters. They both look pleased now, Glasses looking up at the missiles. TOP HAT: Glad that’s behind us. Also, I brought this month’s missile shipment. GLASSES: Could we double our order? KICKER PANEL (tiny panel below the bottom of the strip). Glasses is speaking cheerily to Barry the Cartoonist. GLASSES: To compensate the innocent Yeminis we killed, we’re giving a billion dollars to U.S. weapons manufacturers. 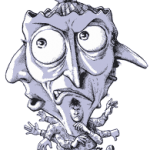 This entry posted in Cartooning & comics, International issues. Bookmark the permalink. You capture the blithe callousness of warmongering elites wonderfully. Ain’t it wonderful?